Welcome to Sunday's post and I'll start off by welcoming my newest follower; Hammer and Forge. Welcome to Inso's World and I hope you enjoy your stay. Feel free to comment on things and take ideas to help you with your own creations...I don't even mind blatant copying either :) . 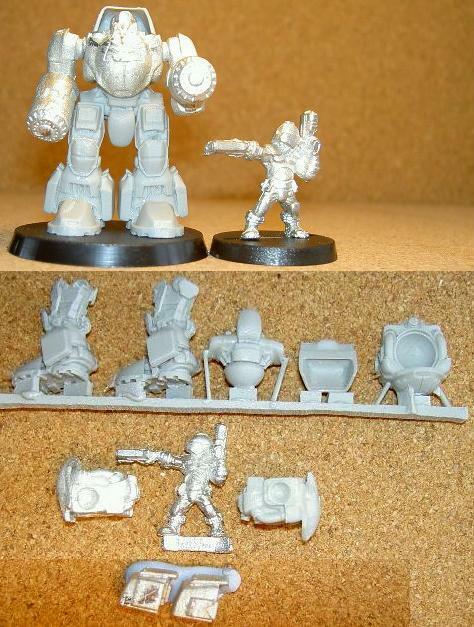 First of all, the top picture shows the Heavy Battle Armour standing comfortably on a 40mm plastic base, next to a Grymn. You can see straight away that it is twice the height of the Grymn so could not be worn as a suit. Next, you will notice that the torso in the assembled mech is metal. That is because Micropanzer realised that the resin ones would be spoiled when you remove them from the sprue, so they sent metal ones to cover it (excellent stuff!). That means (in my particular case) that I have the resin torsos to play about with. I'll go into that shortly. Next, you will notice at the bottom of the picture that the two shoulder pads are actually handed (ie different for right and left shoulders)...I didn't notice so the one I sent to a friend had two the same...DOH! So...my plans. The legs and abdomen look well capable of holding a larger torso and the arms are suitably large enough to cope as well. That means that I can tinker with the resin torso to see if I can make it big enough to realistically fit a seated Grymn. I will have to be careful about going too far forward with the torso construction because the arms will need to be able to hold the gun across the chest but I reckon that I will be able to come up with something. I may follow a similar idea as AT Votoms and have different types of mech, based on the same design. That means that I can have four different mechs without having to get everyone identical... making conversion much easier. Now all I have to do is get cracking. I have received some lovely toys from a mate as a gift (one of which is next to the mech in the pic) so thank you Gi6ers...much appreciated! That means that I will be able to put together a command section for my latest army now... and also add another mecha to my growing collection (more to come on that in a later post). I have a parcel waiting for me at the post office. I have finally managed to get my hands on a 1/60 scale Scopedog model kit. This will be the start of a massive project that will eventually mean I need to build a shed! I am very excited about it but it is very much a future project that I can't see myself starting for a few years...but by that time all the preparations will be complete. I have three sculpts that I need to do. One commission, one gift and one for a competition. I am sorry to say that I haven't started any of them yet BUT they are on my mind so they will be some light relief between painting Grymn and their armoured vehicles. This week I hope to start sculpting, get the vehicles varnished and possibly come up with a new torso for the mechs... interesting times ahead. My son is 16 this week! 16! I am amazed that I managed to help raise a child for that long and immensely proud of the way he has turned out. See you from the tree-house!